A phenotype is the physical expression of DNA. In contrast, the genotype is the chemical makeup of DNA that causes a particular phenotype. DNA is first transposed into RNA, a slightly different information molecule, which can then be translated into a protein. Phenotypes are caused by the interactions of the many different proteins created by DNA. This process can get incredibly complicated. Even in the lowest lifeforms there are thousands of genes, creating thousands of different proteins. These proteins interact in complex ways with each other and the environment, allowing the organism to obtain energy from nutrients. In a simple sense, each gene can produce a single protein. This protein can take several different forms, based on the different alleles in the population. Some of these forms will be functional, while other forms will be less functional or not work at all. If a trait is controlled by a single protein, the genotype that the animal receives for that protein will determine if that trait is adaptive or detrimental in the pursuit of reproduction. For instance, people with cystic fibrosis (CF) have a mutation in the gene that produces a protein specific to transporting chlorine molecules across membranes. Because their genotype contains a non-functional mutation, the protein created does not function properly. Thus, they have a non-functional phenotype, causing many health problems. Melanin is a molecule produced by many animals. It is known as a pigment, or a molecule that gives tissue a dark color. In humans, varying levels of melanin in the hair, eyes, and skin are what cause such a wide variety of appearances in the world. While there are many genes that control the distribution of melanin, there are only a few genes responsible for its production. That is why, in any population around the globe, individuals can be found that produce no melanin at all, a condition known as albinism. Those with albinism, regardless of their race or parent’s phenotypes, lack the ability to produce melanin. Without the pigment in their system, their hair and skin appears white, and eyes usually a shade of pink. All populations contain albinism because the pool of genes responsible for producing melanin is large, and a mutation in any of them can disrupt the entire process. Although mutations are rare, when enough people are reproducing, the trait will appear. However, because of the decreased protection from the sun’s rays, many with albinism are subjected to a variety of skin and eye cancers. This may explain why albinism is usually seen in only a small portion of the population. Animals also experience albinism, as the pathways that produce melanin in them are much the same as in humans. In fact, albinism has been documented in most mammals. All mammals use melanin as a pigment. Other groups of animals use different pigments, with different mechanisms for making those pigments. Albinism is also possible in those animals, if the genes that produce the pigmented phenotype get disrupted. Sometimes these mutations are selected for, as in the case of winter animals, which often show partial albinism in their coats, allowing them to blend in and absorb more solar energy. Gregor Mendel is most known for his contributions to genetics. As a friar at a Germany abbey, Mendel studied the phenotypes of peas. Mendel was particularly interested in the phenotype ratio between the offspring. Mendel noticed that when he bred yellow peas with green peas, sometimes the offspring would be half yellow and half green, and sometimes the offspring would be all yellow. Mendel concluded that each pea carries two forms of the gene for color. We now call these alleles, and we know why Mendel’s peas would produce offspring in different ratios of colors. In the following Punnett squares, each square represents a potential offspring between the parents listed on the outside of the larger square. Remember, each parent gives one allele to each offspring. The Punnett square is easy way to visualize this. Transpose – Staying in the language of DNA, to transpose is to copy DNA into an RNA molecule that serves as the reciprocal of the DNA. Translate – Switching to the language of proteins, RNA is then converted to a chain of amino acids by reading the RNA in groups of three known as codons. Phenotypic Ratio – The ratio of one phenotypes to the others in a population, which is different than the genotypic ratio. Allele – A specific form of a gene, of which you will receive one from each parent, giving you two alleles for every genotype which work together (or against each other) to produce the phenotype. 1. Observe the graphic on pea plants. 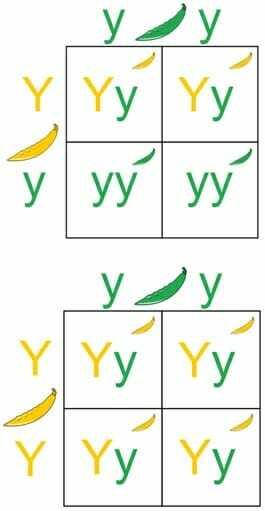 In one of the YY pea plants, a geneticist is able to change one of the Y (yellow) alleles to a y (green) allele. What will this change? A is correct. If the geneticist were able to do this, only the genotype would change. Remember that it takes two green alleles to produce a green phenotype. In this case, only one Y (yellow) was replaced. Because Y (yellow) is dominant, it only takes one to maintain the yellow phenotype. 2. In humans, brown eyes are a dominant trait, while blue eyes are recessive. Two parents with brown eyes have a child with blue eyes. How is this possible? B. Each parent contributed one recessive allele. C. The baby is a mutant. B is correct. While it is possible that the baby’s cells mutated after conception, it is much more likely that the baby received a recessive allele from each parent. While showing the brown eye phenotype, each parent could also have a recessive blue eye allele. If both parents contribute their recessive allele to the baby, the baby will have two recessive alleles, and blue eyes. 3. Two people with albinism compare their DNA and find that they don’t have the same mutations. How can they both show the phenotype of albinism? A. Different pathways are mutated. C. Genetic testing is inconclusive. A is correct. The pigment melanin starts as a completely different chemical and must go through a variety of chemical reactions before it becomes functional melanin. If any one of the enzymes or pathways gets obstructed because of a mutation in the DNA, the whole pathway shuts down. In this way, two people can have completely different mutations and show the same phenotype.